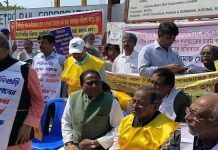 Kolkata: A meeting between the West Bengal State Election Commission (SEC) and the recognised political parties today ended inclusive with almost all the opposition parties alleging that the SEC has failed to come up with a concrete security plan for the coming Panchayat poll. The meeting was convened by SEC following a directive of the Calcutta High Court that “meaningful discussions” must be held with the political parties and they should be briefed on the security arrangements being made for the poll. 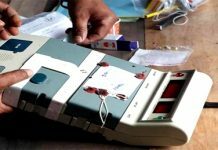 But emerging out of the meeting chaired by state election commissioner Amarendra Kumar Singh, almost all the opposition political parties said that the commission has failed to share any concrete plans about the security arrangements. Angry BJP leaders have even hinted at moving the Calcutta High Court again on Monday. “The outcome of today’s meeting is zero. The commissioner could not share with us any plan as regards how many security personnel is being mobilised for the election and what is the deployment plan for per polling booth. This is even is barely a fortnight is left for the polls. He has only noted whatever we demanded as regards the security arrangements,” BJP leader Pratap Banerjee said. 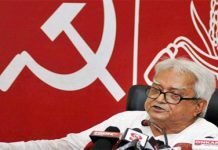 CPI-M leader Robin Deb said that the SEC is failing to ensure the security of opposition party candidates and leaders now, how could it ensure the security of the voters if the vote is held on a single day, i.e. 14 May? “We have demanded that the voting should be held in three phases and this will address the security concern as more policemen can be deployed per booth. But the commissioner says he cannot say anything about this,” Deb said.